Imagine this: you’re walking along the edge of a beautiful pond in the park with friends and family. There was some rainfall earlier in the day but you’ve looked everything over and it seems to have dried. While walking, you step up onto a curb made of slick, new material. Your shoes slip -- next thing you know, you’re falling hard on your foot. What do you do now? Depending on how much physical pain you’re in, you will need to decide whether or not trying to stand is appropriate at the time. If you can’t even imagine trying to stand, better to be safe than sorry and ask a bystander to call an ambulance for you. If you can still stand but you are in pain, you will still want to be seen as soon as possible but it may not be an immediate medical emergency. Even if you can put weight on the injured foot, you should still call an ambulance in situations where you don’t have someone immediately available to help transport you to an urgent care facility to be evaluated. If and when you’re waiting for someone to help, do your best to keep the leg of your injured foot straight and immobile as much as possible. The best thing to do is to have your foot elevated above your heart to slow down the onset of swelling and keep new blood flowing to the injured site - but this is not always possible in all scenarios. Once you have had your injury examined by a doctor, either through urgent care or through the emergency room, be sure to follow up with foot doctors Dr. Les J. Glubo and Dr. Dawn O. Figlo for long-term care and prevention. While our podiatrists don’t treat ankle fractures or perform surgery on ankles, they do treat ankle and other foot injuries. This means Dr. Glubo, Dr. Figlo, and their podiatry team at Grand Central Footcare can help you treat and advise for rehabilitation to prevent long term damage and reduce your likelihood of re-injuring the affected ankle. 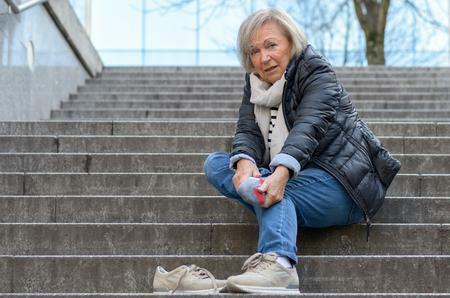 Once your ankle is broken or sprained, it can become vulnerable to re-injury and to developing conditions like arthritis, so taking extra precautions with a trusted podiatrist is your best defense against this happening all over again. Get a head start on keeping your ankles happy and lengthy in the long run by calling us today at (212) 697-3293 to schedule your next appointment at our location in Grand Central, New York City!